January 28th, 2016, Charlottetown – Olivia Wood picked up P.E.I.’s lone medal at a recent short-track speed skating event in Hampton, New Brunswick. The Rose Valley native grabbed a bronze medal in division 4, after posting a pair of strong personal best times at the one-day event. 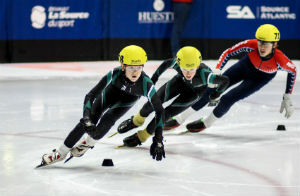 William Lyons (left) of the Eastern Kings Speed Skating Club posted the fastest times among P.E.I. speed skaters at a recent short-track speed skating meet in Hampton, N.B.. Photo courtesy of Kristen Binns. Wood was part of a four member Island contingent, which also included William Lyons of the Eastern Kings Speed Skating Club, Daniel MacKinnon of Murray River and Alex Rogers of Charlottetown. Lyons had the fastest P.E.I. times, narrowly missing the podium in division 1 with a 4th place finish. MacKinnon took 5th place in division 2 with a personal best in his 400 metre event, while Rogers nabbed 8th, also in division 2. Misha Boulerice and Alyssa Rusk, both from Fredericton, took home the respective male and female top honours from the meet, which featured 79 skaters from seven clubs in New Brunswick and P.E.I..
Island short-track skaters are now preparing for their next meet in Dieppe, N.B. on February 6 & 7. Close to thirty P.E.I. speed skaters will race in a field of 195 competitors, as Atlantic skaters look to earn berths in the Canada East Short Track Championships, being hosted in Charlottetown on March 26 and 27.